The human mind incessantly seeks novelty, excitement. It is never enough to savour the fragrance of the experience - one must always move on toe experiences which are new. Then the music lover or connoisseur is the catalyst for change for the unceasing introduction of fresh ideas and new paths which the artiste must seek and find. The psyche of any receiver is also obsessed with another phenomenon - the need to feel an object of pleasure in the context of a perspective and in relation to other things similar. The idea of the Jugalbandi perhaps was born out of this curiosity of both artiste and listener to see how a certain star or style fares in relation to another. Jugal-gaan or two vocalists performing together is an old, albeit isolated, tradition in Indian Classical Music. The pair of singers however were always either brothers or students of the same teacher and thus developed a concert style where each would take turns at improvisation and one would complement or echo the other in turns. The concept of a musical ‘duel’ was also strongly entrenched in the tradition in a different context. This was a purely competitive medium, often quite negative in spirit and intent. The modern day Jugalbandi is a ‘duel with a difference’ in that it is a highly positive and creative exercise, born of a great degree of mutual respect between the players. The object is primarily to create a synergy of ideation and sound in a celebration of the solidity of structure in Indian Classical Music which enables two perfect strangers to come together before an audience and make music together on the spot. For the listener however, it cannot be denied that the spirit of competition between titans is of great attraction. Perhaps, it is this which makes Jugalbandi the most popular concert format in contemporary times. 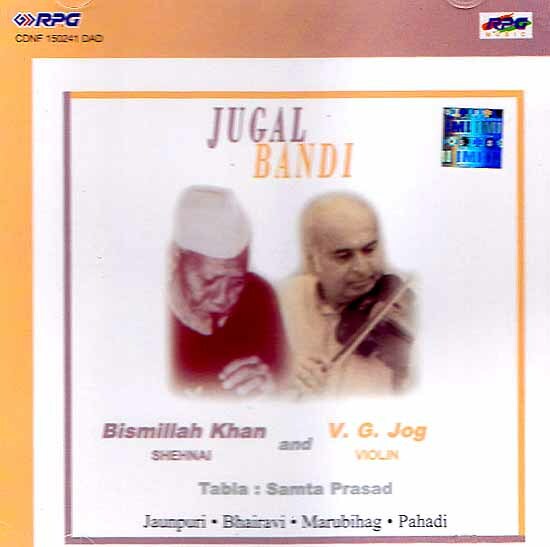 The credit of establishing to the world of music that instrumental Jugalbandi can be a thrilling, aesthetic and novel experience should rightly go to the Bismillah Khan - V.G. Jog team. They showed the would what complementarity in timbre, ideation and movement can be in an art which has always been a solo concerto art. From alaap, to bol-bant to jhala, the tapestry created by the soft, feminine flutters of the shehnai and the platinum boldness of the violin tone and V.G. Jog’s staccato style, was stunning. In this album the celebrated duo present the ragas Jaijaiwanti, Bahar and Mishra Khamaj.